Avenged Sevenfold‘s sixth studio album, ‘Hail To The King’, sold 159,000 copies in its first week of release, giving the California band their second straight chart-topper after 2010′s ‘Nightmare’, no small feat for a band that’s consistently evolved with each album, taking on a new sound each time. 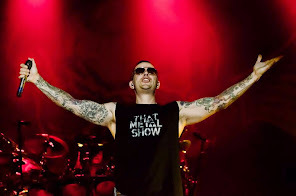 Alin Ilejay, a former member of Confide, joined Avenged Sevenfold in early 2011, to the surprise of many fans, as the replacement for James “The Rev” Sullivan, who passed away tragically in 2009. Their latest release is the first to take place without Sullivan’s input, and Ilejay has been touring pretty consistently with them since taking over the sticks. So far, 2013 has proven to be a pretty hectic adventure with a lot going on for both Ilejay and the band. “It’s just been pretty insane, it’s a whole new experience for me and I’ve just been working on bringing a killer show every single time. There’s just so much touring plans adding up and adding up and adding up and the only real focus has become making sure I have enough energy for every show so that none of the shows are lacking. Avenged Sevenfold play The 02 on December 3rd alongside Five Finger Death Punch and Avatar.